Sorghum is the common and genus name for various species of grasses (family Poaceae), characterized by an inflorescence (head) and grain (fruit or edible seed) in the form of a panicle, spikelets borne in pairs, and extensively branching roots. In particular, the term is popularly used for Sorghum bicolor (syn. S. vulgare), which is an extensively cultivated species. Sorghum is grown in warmer climates worldwide. Sorghum is used for a variety of purposes. 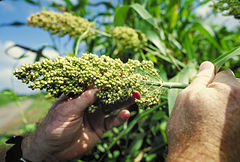 As a grain sorghum, it is used as food for people and for livestock and poultry. Grain sorghum is the fifth most important cereal crop in the world and third most important cereal crop grown in the United States. It is the principle food grain for more than 750 million people in semi-arid areas. Sweet sorghums are used for producing syrups and molasses (the plants are closely related to sugar cane) and grass sorghums are used for pasture and hay. Broomcorns are use to produce fiber for brooms. Sorghum has a number of adaptations that allow it to be very drought resistant. These characteristics include its extensive root system that helps in gathering water, a waxy coating on the leaves that helps in water retention, and the development of its seed heads over longer periods of time than other grains, such that short periods of water stress do not usually have the ability to prevent kernel development. These adaptations that advance the individual needs of the plants for their own survival and reproduction also allows the plant to serve a larger purpose as a valuable subsistence crop for those living in semi-arid tropical regions. Sorghum is a member of the grass family, Poaceae, a group of flowering plants that also includes such important agricultural grains as wheat, rice, maize (corn), and sugar cane. Grasses typically have hollow stems (called culms) that are plugged at intervals (the nodes), with leaves arising at the nodes. The leaves generally are differentiated into a lower sheath hugging the stem for a distance and a blade. There are small, wind-pollinated flowers grouped into spikelets. The fruit is a caryopsis with the seed and fruit merged together to form a hard dry grain. The genus Sorghum is one of about 600 genera in Poaceae. This genus is in the subfamily Panicoideae and the tribe Andropogoneae. It is a close relative of sugar cane (Saceharum officinarum), which belongs to the same tribe. There are about 30 species in the Sorghum genus, some of which are raised for grain and many of which are used as fodder plants either cultivated or as part of pasture. Species are native to tropical and subtropical regions of all continents in addition to the South West Pacific and Australasia. Similar to corn (maize) in early stages, and with corn-like leaves and tall stalks, sorghum varies considerably from corn in later stages. The inflorescence and grain (fruit/seed) is a panicle and sorghum is characterized by spikelets borne in pairs (FAO 1995a). Sorghum has more side shoots than corn, putting out new shoots and producing several head-bearing culms from the nodes. Sorghum also has a more extensively branched root system. A waxy coating on the leaves and stems helps to retrain water even in intense heat. Sorghum bicolor is the primary cultivate Sorghum species. The species originated in northern Africa and can grow in arid soils and withstand prolonged droughts. S. bicolor grows in clumps that may reach over four meters high, although shorter, and easier to harvest varieties have been developed. The grain (kernel or seed) is small, reaching about three to four millimeters in diameter. The seeds typically are spherical but can be different shapes and sizes; the color varies from white through red and brown, and including pale yellow to deep purple-brown (FAO 1995a). Different types of Sorghum bicolor are recognized including grain sorghums, sweet sorghums, and grass sorghums. 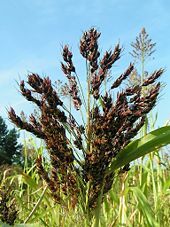 Originally Linnaeus delineated three species of cultivated sorghum: Holcus sorgum, H. saccaratus, and H. tricolor. In 1794, Moench distinguished the genus Sorghum from Holcus and in 1961 the name of Sorghum bicolor (L.) Moench was proposed as the correct name for the species (FAO 1995a). Sorghum bicolor is known by a variety of names, including milo or milo-maize in the United States, dura in Sudan, great millet and guinea corn in West Africa, kafir corn in South Africa, mtama in eastern Africa, and jowar in India (FAO 1995a). There are many varieties. Commercial sorghum refers to the cultivation and commercial exploitation of species of grasses within the genus Sorghum. These plants are utilized for grain, fiber, and fodder. The plants are cultivated in warmer climates worldwide. Commercial Sorghum species are native to tropical and subtropical regions of Africa and Asia, with one species native to Mexico. Sorghum is well adapted to growth in hot, arid or semi-arid areas. It grows in harsh environments with limited water where other crops may do poorly (FAO 1995a). The main commercial species, Sorghum bicolor, has many subspecies and varieties that are divided into four groups—grain sorghums (such as milo), grass sorghums (for pasture and hay), sweet sorghums (formerly called "guinea corn," used to produce sorghum syrups), and broom corn (for brooms and brushes). The name "sweet sorghum" is used to identify varieties of S. bicolor that are sweet and juicy. Domestication probably took place in sub-Saharan Africa. This is suggested by the fact that the last wild relatives of commercial sorghum are currently confined to Africa south of the Sahara—although Zohary and Hopf (2000) add "perhaps" Yemen and Sudan. However, note Zohary and Hopf (2000), "the archaeological exploration of sub-Saharan Africa is yet in its early stages, and we still lack critical information for determining where and when sorghum could have been taken into cultivation." Although rich finds of S. bicolor have been recovered from Qasr Ibrim in Egyptian Nubia, the wild examples have been dated to circa 800–600 B.C.E. and the domesticated ones no earlier than CE 100. The earliest archeological evidence comes from sites dated to the second millennium B.C.E. in India and Pakistan—where S. bicolor is not native. These incongruous finds have been interpreted, according again to Zohary and Hopf (2000), as indicating: (i) An even earlier domestication in Africa, and (ii) an early migration of domestic sorghum, from East Africa into the Indian subcontinent. The Food and Agricultural Organization of the United Nations (FAO) notes that sorghum likely was taken from eastern Africa to India during the first millennium B.C.E. and that it existed there around 1000 B.C.E. (FAO 1995a). This interpretation of the origin of commercial sorghum gains further support from the fact that several other African grain crops, namely: pearl millet (Pennisetum glaucum (L.) R. Br. ), cow pea (Vigna unguiculata (L.) Walp. ), and hyacinth bean (Lablab purpureus (L.) Sweet) show similar patterns. Their wild progenitors are restricted to Africa (Zohary and Hopf 2000). The FAO reports that cultivated sorghum likely arose from a wild form belonging to the subspecies verticilliflorum (FAO 1995a). Most cultivated varieties of sorghum can be traced back to Africa, where they grow on savanna lands. During the Muslim Agricultural Revolution, sorghum was planted extensively in parts of the Middle East, North Africa, and Europe (Watson 1983). The name "sorghum" comes from Italian "sorgo," in turn from Latin "Syricum (granum)" meaning "grain of Syria." Despite the antiquity of sorghum, it arrived late to the Near East. It was unknown in the Mediterranean area into Roman times. Tenth century records indicate that it was widely grown in Iraq, and became the principal food of Kirman in Persia. In addition to the eastern parts of the Muslim world, the crop was also grown in Egypt and later in Islamic Spain. From Islamic Spain it was introduced to Christian Spain and then France (by the twelfth century). In the Muslim world, sorghum was grown usually in areas where the soil was poor or the weather too hot and dry to grow other crops (Watson 1983). Grain sorghum likely arrived in America from West Africa as “guinea corn” around the middle of the nineteenth century with slave traders (FAO 1995a). UN Food & Agriculture Organisation (FAO),  Retrieved February 24, 2009. The FAO reports that 440,000 square kilometers were devoted worldwide to sorghum production in 2004. The United States is the world’s largest producer, followed by India and Nigeria (USGC 2008). In the United States, sorghum mainly is produced for animal feed. In India, it is produced as an important food for people. The top exporters are the United States, Australia, and Argentina (USGC 2008). The United States has held a share of seventy percent or more of the world trade throughout the last decade, with exports mainly to Mexico (USGC 2008). As a continent, Africa is the largest producer with about 21.6 million metric tons (850.6 million bushels) annually (USGC 2008). It is the leading cereal grain produced in Africa (USGC 2008). Sorghum requires an average temperature of at least 25 °C to produce maximum grain yields in a given year. Maximum photosynthesis is achieved at daytime temperatures of at least 30 °C. Night time temperatures below 13°C for more than a few days can severely impact the plant’s potential grain production. Sorghum cannot be planted until soil temperatures have reached 17 °C. The long growing season, usually 90–120 days, causes yields to be severely decreased if plants are not in the ground early enough. Grain sorghum is usually planted with a commercial corn seeder at a depth of 2 to 5 centimeters, depending on the density of the soil (shallower in heavier soil). The goal in planting, when working with fertile soil, is 50,000 to 300,000 plants per hectare. Therefore, with an average emergence rate of 75%, sorghum should be planted at a rate of 2 to 12 kilograms of seed per hectare. It has been found that yields can be boosted by ten to fifteen percent when optimum use of moisture and sunlight are obtained by planting in 25 centimeter rows instead of the conventional 1 meters rows. Sorghum, in general is a very competitive crop, and does well in competition with weeds in narrow rows. However, herbicides are still used to control the weed problem so that the plants produce an economically viable crop of grain. Insect and diseases are not prevalent in sorghum crops. Birds, however, are a major source of yield loss. Hybrids with higher tannin content and growing the crop in large field blocks are solutions used to combat the birds. The crop may also be attacked by corn earworms, aphids, and some Lepidoptera larvae, including turnip moth. Sorghum is a very high nitrogen feeding crop. An average hectare producing 6.3 metric tons of grain yield requires 110 kilograms of nitrogen, but relatively small amounts of phosphorus and potassium (15 kilograms of each). Sorghum’s growth habit is similar to that of maize (corn), but with more side shoots and a more extensively branched root system. The root system is very fibrous, and can extend to a depth of up to 1.2 meters. Wild species of sorghum tend to grow to a height of 1.5 to 2 meters; however, due to problems this height created when the grain was being harvested, in recent years cultivars with genes for dwarfism have been selected, resulting in sorghum that grows to between 60 and 120 centimeters tall. The plant finds 75 percent of its water in the top meter of soil, and because of this, in dry areas, the plant’s production can be severely affected by the water holding capacity of the soil. The plants require up to 70 to 100 millimeters of moisture every 10 days in early stages of growth, and as sorghum progresses through growth stages and the roots penetrate more deeply into the soil to tap into hidden water reserves, the plant needs progressively less water. By the time the seed heads are filling, optimum water conditions are down to about 50 millimeters every 10 days. Compacted soil or shallow topsoil can limit the plants ability to deal with drought by limiting its root system. Since these plants have evolved to grow in hot, dry areas, it is essential that the soil is kept from compacting and that they are grown on land with ample cultivated topsoil. Sorghum's yields are not affected by short periods of drought as severely as other crops such as maize because it develops its seed heads over longer periods of time, and short periods of water stress do not usually have the ability to prevent kernel development. Even in a long drought severe enough to hamper sorghum production, it will still usually produce some seed on smaller and fewer seed heads. Rarely will you find a kernelless season for sorghum, even under the most adverse water conditions. Sorghum's ability to thrive with less water than maize may be due to its ability to hold water in its foliage better than maize. Sorghum has a waxy coating on its leaves and stems which helps to keep water in the plant even in intense heat. Sorghum is used for food, fodder, the production of alcoholic beverages, the production of biodiesel, construction of brooms and brushes, and other purposes. Being drought tolerant and heat tolerant, it is especially important in arid regions. Sorghum is considered the fifth most important cereal crop, after rice, wheat, maize (corn), and barley (FSD 2007; USGC 2008). For over 750 million people in the semi-arid tropics of Africa, Asia, and Latin America, it is the main food grain (FSD 2007). In the United States, sorghum grain is used primarily as a maize substitute for livestock feed because their nutritional values are very similar. Grass sorghum also is grown for pasture and hay. Some hybrids commonly grown for feed have been developed to deter birds, and therefore contain a high concentration of tannins and phenolic compounds, which causes the need for additional processing to allow the grain to be digested by cattle. In arid, less developed regions of the world sorghum is an important food crop especially for subsistence farmers. Millions of people in semi-arid regions of Africa and Asia use sorghum as the most important staple food, serving as the main source of energy, protein, minerals, and vitamins (FAO 1995a). Sorghum is considered to be a “powerhouse of nutrition” (Herbst 2001) and is a rich source of protein, niacin, iron, and vitamin B1 and a good source of vitamin B2 (Bender and Bender 2005). Some varieties are rich in antioxidants and all varieties are gluten-free, offering an alternative for those who suffer from wheat allergies (Herbst 2001)..
Sorghum is used to produce such foods as porridges, breads, couscous, sorghum flour, syrup, malted flours for brewing, cookies, and cakes (FAO 1995b; USGC 2008). Pearled sorghum offers a growing alternative to rice (FAO 1995b). Bhakri (Jolada Rotti in Northern Karnataka), a variety of unleavened bread usually made from sorghum, is the staple diet in many parts of India such as Maharashtra state and northern Karnataka state. In eastern Karnataka and the Rayalaseema area of Andhra Pradesh, roti (Jonna rotte) made with sorghum is the staple food. In South Africa, sorghum meal is often eaten as a stiff porridge much like pap. It is called mabele in Northern Sotho and brown porridge in English. The porridge can be served with maswi (soured milk) or merogo (a mixture of boiled greens, much like collard greens or spinach). In the cuisine of the Southern United States, sorghum syrup is used as a sweet condiment, usually for biscuits, corn bread, pancakes, hot cereals ,or baked beans. It was used as maple syrup is used in the North, although it is uncommon today. Sweet Sorghum syrup is known as molasses in some parts of the United States, though it is not true molasses. In Arab cuisine, the unmilled grain is often cooked to make couscous, porridges, soups, and cakes. Many poor use it, along with other flours or starches, to make bread. Sorghum is used in various cultures to produce alcoholic beverages. In China, sorghum is the most important ingredient for the production of distilled beverages such as Maotai and kaoliang, as seen in the 1987 film Red Sorghum. In southern Africa, sorghum is used to produce beer, including the local version of Guinness. African sorghum beer is a brownish-pink beverage with a fruity, sour taste. It has an alcohol content that can vary between one percent and eight percent. African sorghum beer is high in protein, which contributes to foam stability, giving it a milk-like head. Because this beer is not filtered, its appearance is cloudy and yeasty, and may also contain bits of grain. This beer is said to be thirst quenching even if it is traditionally consumed at room temperature. African sorghum beer is a popular drink primarily amongst the black community for historical reasons. African sorghum beer is said to be a traditional drink of the Zulu people of Southern Africa. It also became popular among the black community in South Africa because the only exception to the prohibition, which was lifted in 1962 and only applied to black people, was sorghum beer. Sorghum beer is called bjala in Northern Sotho and is traditionally made to mark the unveiling of a loved-one's tombstone. The task of making the beer falls traditionally to women. The process is begun several days before the party, when the women of the community gather together to bring the sorghum and water to a boil in huge cast-iron pots over open fires. After the mix has fermented for several days it is strained—a somewhat labor intensive task. Sorghum beer is known by many different names in various countries across Africa, including burukuto (Nigeria), pombe (East Africa) and bil-bil (Cameroon). African sorghum beer is brewed using grain sorghum and undergoes lactic acid fermentation as well as alcoholic fermentation. The steps in brewing African sorghum beer are: malting, mashing, souring, and alcoholic fermentation. All steps, with the exception of the souring, can be compared to traditional beer brewing. The souring of African sorghum beer is done by lactic acid fermentation, and is responsible for the distinct sour taste. Souring may be initiated using yogurt, sour dough starter cultures, or by spontaneous fermentation. The natural micro flora of the sorghum grain maybe also be the source of lactic acid bacteria; a handful of raw grain sorghum or malted sorghum may be mixed in with the wort to start the lactic acid fermentation. Although many lactic acid bacteria strains may be present, the Lactobacillus spp. is responsible for the lactic acid fermentation in African sorghum beer (Van der Walt 1956). Commercial African sorghum beer is packaged in a microbiologically active state. The lactic acid fermentation and/or alcoholic fermentation may still be active. For this reason, special plastic or carton containers with vents are used to allow gas to escape. Spoilage is a big safety concern when it comes to African sorghum beer. Packaging does not occur in sterile conditions and many microorganisms may contaminate the beer. Also, using wild lactic acid bacteria increases the chances of spoilage organisms being present. However, the microbiologically active characteristic of the beer also increases the safety of the product by creating competition between organisms (Haggblade and Holzapfel 1989). Although aflatoxins from mold were found on sorghum grain, they were not found in industrially produced African sorghum beer (Trinder 1998). In recent years, sorghum has been used as a substitute for other grain in gluten free beer. Although the African versions are not "gluten free," as malt extract is also used, truly gluten free beer using such substitutes as sorghum or buckwheat are now available. Sorghum is used in the same way as barley to produce a "malt" that can form the basis of a mash that will brew a beer without gliadin or hordein (together "gluten") and therefore can be suitable for coeliacs or others sensitive to certain glycoproteins (Smagalski 2006). In November 2006, Lakefront Brewery of Milwaukee,Wisconsin launched its "New Grist" gluten-free beer, brewed with sorghum and rice. It is aimed at those with celiac disease (Daykin 2006). On December 20, 2006, Anheuser-Busch of St. Louis, Missouri announced the release of their new "Redbridge" beer product. This beer likewise is gluten-free and produced with sorghum as the main ingredient. Redbridge is the first sorghum based beer to be nationally distributed in the United States. Some varieties of sorghum have been used for thatch, fencing, baskets, brushes, and brooms, and stalks have been used as fuel. Sorghum straw (stem fibres) can also be made into excellent wall board for house building, as well as biodegradable packaging. It does not accumulate static electricity, so it is also being used in packaging materials for sensitive electronic equipment. The reclaimed stalks of the sorghum plant are used to make a decorative millwork material marketed as Kirei board. Medieval Islamic texts list medical uses for the plant (Watson 11983). Sorghum is used to produce biofuel. There are claims that that sorghum-sap-based ethanol has 4 times the energy yield as corn-based ethanol; it is on par with sugar-cane. The sap could be used for ethanol while the grain is used for food (Blaney 2008). Blaney, B. 2008. Sweet sorghum's sap good for ethanol. Associated Press. May 14, 2008. Retrieved February 24, 2009. Daykin, T. 2006. Brewing up a niche: Lakefront Brewery finds success with New Grist, a brand for those who can't tolerate gluten in beer. Milwaukee Journal-Sentinel July 2, 2006. Retrieved February 24, 2009. Food and Agricultural Organization (FAO) of the United Nations. 1995a. Sorghum and millets in human nutrition: Chapter 1: Introduction. FAO Corporate Document Repository. Retrieved February 23, 2009. Food and Agricultural Organization (FAO) of the United Nations. 1995b. Sorghum and millets in human nutrition: Chapter 5. Nutritional quality of foods prepared from sorghum and millets. FAO Corporate Document Repository. Retrieved February 23, 2009. Food Security Department (FSD). 2007. Chapter VII Sorghum: Post-harvest Operations. 1. Introduction. In INPhO (Information Network on Post-Harvest Operations), Compendium on Post-harvest Operations. Retrieved February 23, 2009. Germplasm Resources Information Network (GRIN). Sorghum bicolor (L.) Moench subsp. bicolor. United States Department of Agriculture, Agricultural Research Service. Retrieved February 23, 2009. Haggblade, S., and W. H. Holzapfel. 1989. Industrialization of Africa's indigenous beer brewing. Pages 191-283 in K. H. Steinkraus, ed., Industrialization of Indigenous Fermented Foods. New York: Marcel/Dekker. ISBN 0824780744. Smagalski, C. 2006. Gluten free beer resources. GlutenFreeBeerFestival.com. Retrieved February 24, 2009. Trinder, D. W. 1998. A survey of aflatoxins in industrially brewed South African sorghum beer and beer strainings. J. Inst. Brew. 95(5): 307–309. Van der Walt, H. P. 1956. Kafficorn matling and brewing studies II-Studies on the microbiology of Kaffir Beer. J. Sci. Food. Agric. 7(2): 105–113. Watson, A. M. 1983. Agricultural Innovation in the Early Islamic World: The Diffusion of Crops and Farming Techniques, 700–1100. Cambridge: Cambridge University Press. ISBN 052124711X. Zohary, D., and M. Hopf. 2000. Domestication of Plants in the Old World, 3rd edition. Oxford: University Press. ISBN 0198503571. This page was last modified on 12 October 2015, at 16:59.